I made a batch of these cupcakes for my husband’s birthday using carrot cake mix and canned cream cheese frosting. 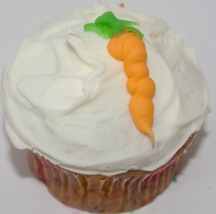 I’m not a fan of carrot cake, but I thought these came out pretty cool, with very little effort. What You Need: 1 cupcake; cream cheese frosting; icing tinted orange; icing tinted green. How to Make It: I found a lot of fancy ways to make carrots using pastry bag tips, but it turns out you can make a really cool carrot just using a plastic bag with the corner cut off and “jiggling” it a bit as you draw the carrot. Make the leaves the same way, but cut a smaller hole. If you want to use metal tips, either with a pastry bag or prepackaged tube, try tip #3 for the carrot and #1 or a leaf tip for the leaves. This entry was posted on Saturday, May 3rd, 2008 at 11:29 pm	and is filed under birthday cupcakes, food cupcakes. You can follow any responses to this entry through the RSS 2.0 feed. Responses are currently closed, but you can trackback from your own site.